Anolon Bronze is Anolon’s flagship line of cutlery. A full 15-piece set will run you right around a buck fifty, but the price is good for what you get. The blades are made of high-carbon German steel that is heat forged then ice hardened to ensure maximum durability and ability to hold an edge. The blades are full-tang, meaning they extend all the way to the end of the handle. Most full-tang blades have the tang exposed, which allows dirt and grime to get into the gaps between the blade and handle. The Sure Grip handles on these knives cover the tang completely, protecting the tang from corrosion and unsanitary conditions. The Sure Grip material is something owners either love or hate. It’s softer and lighter than a traditional wood or plastic handle, and is ideal for those who spend long days in the kitchen and want a lighter alternative to the norm. The Anolon Bronze line of cutlery is both functional and attractive. You get a handsome hardwood block when you buy the larger sets, so you can show off your new set of knives by placing it on the counter. 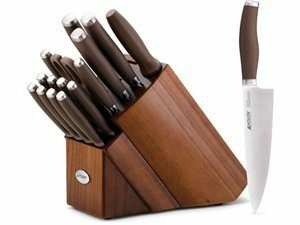 The only downside to buying this set is you don’t get the 7-inch Santoku blade that you do with the 15-piece Anolon Bronze set below. If you ask me, it should be the other way around. Reward buyers of the bigger set with the bigger Santoku. Oh well, rant over. Click here for more information on purchasing the Anolon Bronze 17-piece. Knife Block Set . You get a couple less Anolon steak knives with this set, but you get a 7-inch Santoku. This set and the 17-piece set are close enough together in price to make price a non-issue. It’s up to you whether you want to trade off a couple of steak knives for a bigger Santoku knife.